After a great rebuilding season and a return to the playoffs last season, the Dallas Stars have not shown much of that skill so far. Despite being expected by many to have an even better season this time around, with some even projecting them to win the Stanley Cup (It’s not too late, there’s still hope! ), Dallas currently sits at 6th in the Central Division with a record of 10-12-5. Even with the bad start it’s not all terrible, as Tyler Seguin is currently leading the NHL in goals (21) and is tied with Sidney Crosby for most points (35). It’s no question that the Dallas Stars have some incredible offensive depth, with guys like Jamie Benn, Tyler Seguin, Jason Spezza, Antoine Roussel, and several others providing more than enough offensive skill to be a powerhouse team and take down any team in the league. Seguin is on his way to a possible career high in goals, already just sixteen goals away from last season’s 37 that he scored in 80 games, even putting him on track to surpass the 50 goal mark and a serious contender for both the Maurice Richard and Art Ross Trophies. While Stars captain Jamie Benn is having a slower start than expected, he’s still racking up the points, currently with 8 goals and 17 assists, a total of 25 points. While some people had some doubts about how much Jason Spezza would contribute to the Stars, with some feeling that at 31 years-old he was beginning to wane, he has managed to play great and keep up with the young guns so far. Spezza has brought a lot to the table for the Stars this season, scoring 5 goals and racking up 16 assists for 21 points thus far. He seems to have adjusted to Dallas well and is currently working on the second line, centering Curtis McKenzie and Erik Cole. Hemsky, on the other hand hasn’t played quite like expected, being referred to by some as a bust and one of the worst signings of the summer. He has recently been a healthy scratch for the Stars. Defense is an area that the Dallas Stars have struggled with for years, possibly karma for the killer D the Stars had in the late 90’s/early 2000’s, with names like Derian Hatcher, Craig Ludwig, Sergei Zubov, Daryl Sydor, and Richard Matvichuk striking fear into the hearts of players. Unfortunately, we no longer have Derian Hatcher breaking jaws and taking names and struggle to find that power today. Luckily, GM Jim Nill has taken steps to improving it, trading Brenden Dillon to the San Jose Sharks in exchange for Jason Demers, who seems like he will be able to fill Dillon’s place well and do even better than Dillon ever did. In addition, Nill managed to finally trade away Sergei Gonchar, freeing up lots of precious cap space that can be used to make improvements. One silver lining in the defensive department is John Klingberg, who has played well this season and is blooming to possibly be a key asset to the Stars’ blue line. Klingberg isn’t the only young defenseman showing signs of improving the Stars D, with names like Patrik Nemeth (currently injured) and Jamie Oleksiak, as well as plenty of talent with the Texas Stars, like Julius Honka, who are on their way to being key components in the rebuilding of the Stars defense. Possibly an even bigger problem than defense for the Stars is consistency. It has been said time and time again, you must be consistent in this league. The Stars need to learn to stay consistent when they play well, rather than going from playing spectacularly one game to losing the next few games in a row. 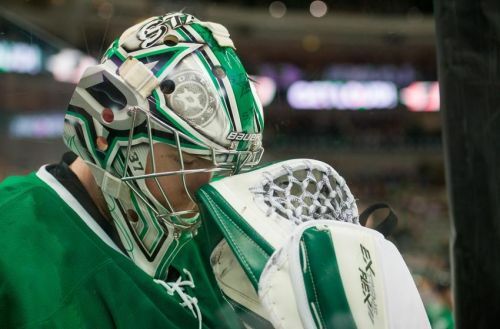 Kari Lehtonen needs to play well every single night, as well as the backup goalies. While many have been looking at the goaltenders as a problem, it’s not all their fault. You can have the best goalie in the world, but he can’t make you a winning team without a strong defense and a consistent offense. If I haven’t said it enough, CONSISTENCY, CONSISTENCY, CONSISTENCY.